Man. This pillow. Look at the goose's utterly expressionless stare. The goose scares me a little, but I am immensely attracted to it also, in the way small objects are attracted to the gravitational pull of a black hole. 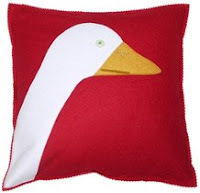 I think this goose would make a wonderful decorative object. And it is the only waterfowl I know that may also be a stone cold killer. From Hable Construction.